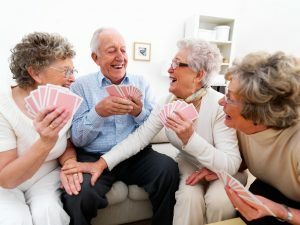 There are many seniors that do in fact look forward to years of fun, companionship, and daily activities to keep both their bodies and brains active. Numerous studies have shown that regular stimulating activities help decline depression among nursing home residents, cut the risk of dementia, and keep their spirits and bodies alive. Activities are vital to keeping up residents’ mental and physical well-being, and even family and friends that visit can take part in the activities! Some residents may enjoy going out for lunch several times a week, shopping, or visiting the local cinema. Others will prefer on-site activities such as games or musical based activities to stimulate their hearts and minds. Our residents are free to be as busy or not busy – whatever they choose! But at The PARC of Joliet, there is always something going on. Visits from family and friends are supported and their participation in patient treatment and educational programs is recommended. Please click on our Calendar below to view our activities that we have planned this month! Click to View, Download, or Print.